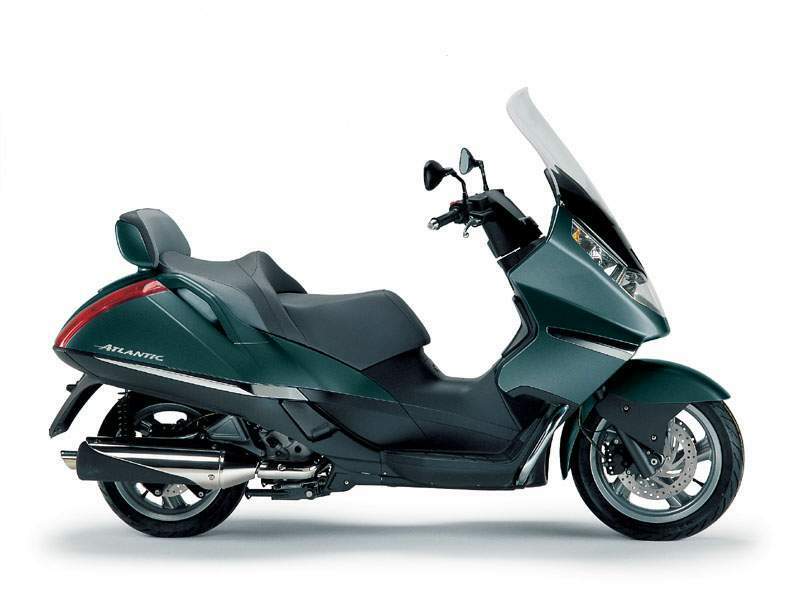 Performance, comfort, spaciousness, and load carrying capacity are the main features of the sportiest maxi scooter around. The Atlantic Sprint is even respectful of the environment and is homologated to Euro 3 standard. Now, with the addition of a new 400cc engine, the Atlantic range is even more complete. The Atlantic Sprint’s footboard has been carefully tapered where you put your feet on the floor, to ensure quick, easy and firm contact with the ground. The ample leg shield and high windshield offer excellent protection against the wind and rain. The luggage rack incorporates passenger grab handles and accepts the optional top box without additional mounting plates or brackets. A second, lockable storage compartment is housed in the rear of the leg shield. If even this volume of storage is not enough, you can easily add an optional 45 litre top box, directly on the standard luggage rack. The Atlantic Sprint’s chassis embodies Aprilia’s race-winning expertise and years of experience in scooter manufacturing. The extremely robust chassis is a perfect match for the high performance engine. The frame and suspension are designed for comfort, agility and safety. The frame itself is of proven structural rigidity and is coupled with a highly efficient fork and shock absorbers. The Aprilia design team has succeeded in creating a scooter with perfect weight distribution, exceptional riding feel and manoeuvrability plus excellent stability. The high strength tubular steel frame incorporates a closed double cradle designed for maximum torsional rigidity and robustness. This rigid and efficient frame gives the Atlantic Sprint faultless stability even at high speeds. The front fork with its 35 mm stanchions ensures precision steering and great suspension with a generous wheel travel of 105 mm. 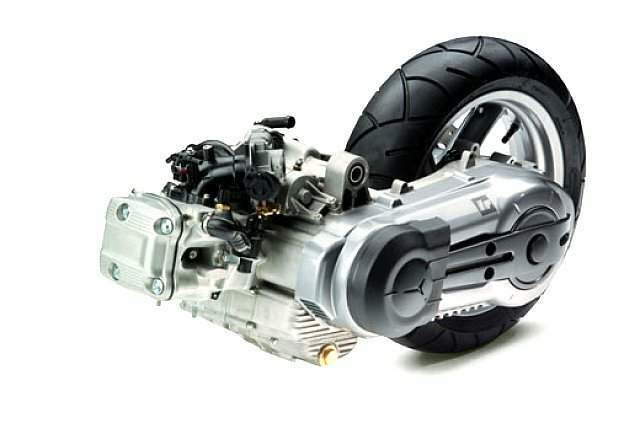 The engine and transmission assembly, which acts as the rear swingarm, is damped by two gas-filled shock absorbers. Spring preload is adjustable to 5 positions, to allow you to achieve maximum suspension efficiency for all levels of load and all types of surface. Wheel travel of 90 mm ensures a smooth ride over even the roughest roads. Another factor contributing to the Atlantic Sprint’s excellent ride is its 14 inch wheels and generous size tubeless tyres (120/70 at the front and 140/60 at the rear). In conjunction with the rigid frame, these wheels and tyres give the Atlantic Sprint excellent stability and make control intuitive even for the novice. So despite its impressive performance, the Atlantic Sprint is beautifully easy to ride! The generous tyres even enhance the effect of the suspension in smoothing out rough roads as well as guaranteeing maximum safety during braking. Brakes, of course, are another of the Atlantic Sprint’s strong points. Integral braking provides reliable, safe and gradual control over all surfaces. The Atlantic Sprint features a 260 mm diameter front disc with floating caliper and three parallel pistons, and a 190 mm rear disc. The principle of integral braking is simple. When you pull on the left hand lever (the rear brake lever) you operate not just the rear brake but one of the three front brake pistons too. A special valve distributes pressure between the two wheels to maximise effect and make braking easy to control even for inexperienced riders. Integral braking dramatically reduces stopping distances and gives you a far greater feeling of safety and control than conventional braking systems. A choice of two large capacity engines satisfies all possible needs, from urban commuting to long range touring. With the arrival of the 400 cc engine, the Atlantic Sprint family has become one of the widest scooter ranges in Europe. Both the 500 and the 400 engine are packed with the latest technology and deliver amazing performance for their respective sizes, together with impressively low emissions, a totally vibration-free ride and unprecedented elasticity. Both engines incorporate advanced, four valve cylinder heads, liquid cooling and the latest generation of automatic transmission. An advanced fuel injection system delivers low fuel consumption and silky smooth power for maximum comfort and riding pleasure. A dynamic balancer shaft minimises vibration. Miserly fuel consumption and a large capacity tank combine to give the Atlantic Sprint excellent autonomy and extended intervals between refuelling. The 500 cc engine is a single cylinder, liquid cooled, four stroke powerplant with a single overhead cam and a four valve head. Thanks to a maximum power of 29 kW at 7500 rpm and maximum torque of 43 Nm at 5500 rpm, the Atlantic Sprint 500 delivers unbeatable performance, easily equivalent to many multi-cylinder motorcycles. In fact, impressive power plus extremely light weight gives it one of the highest levels of performance for any scooter of the same engine size. 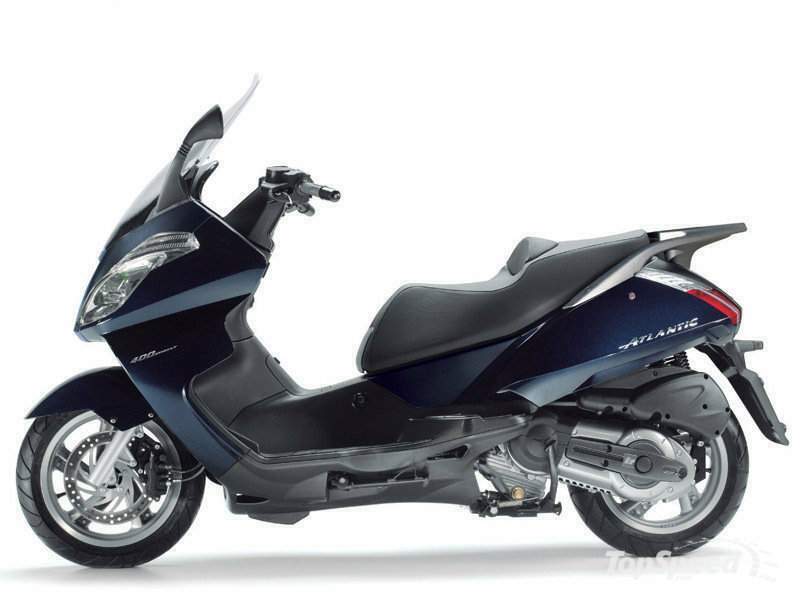 The 400 cc engine is a new introduction to the Atlantic Sprint range for 2007. Based on exactly the same design technology as the 500, it differs from it only in displacement, which is reduced from 460 cc to 399 cc. With 25 kW of power and 37 Nm of torque, the 400 cc engine offers a level of performance almost as high as its bigger brother, but the Atlantic Sprint 400 can be ridden by A2 class license holders (under Italian legislation). Less capacity can also mean significant savings on insurance (up to 40% on the Italian market). Both engines are equipped as standard with a three way catalytic converter and conform easily to Euro 3 emission control standards. large windshield with hand-guards, 50 litre tunnel bag, passenger backrest, Street Case II 47 litre top box in matching paint finish, 35 litre City top box in matching paint finish personalised for Atlantic, optional top box backrests..